Who says you need a wok to make an epic stir fry? While you Mongolian BBQ fans out there may be hesitant to try this at home, don’t be stir fry shy! 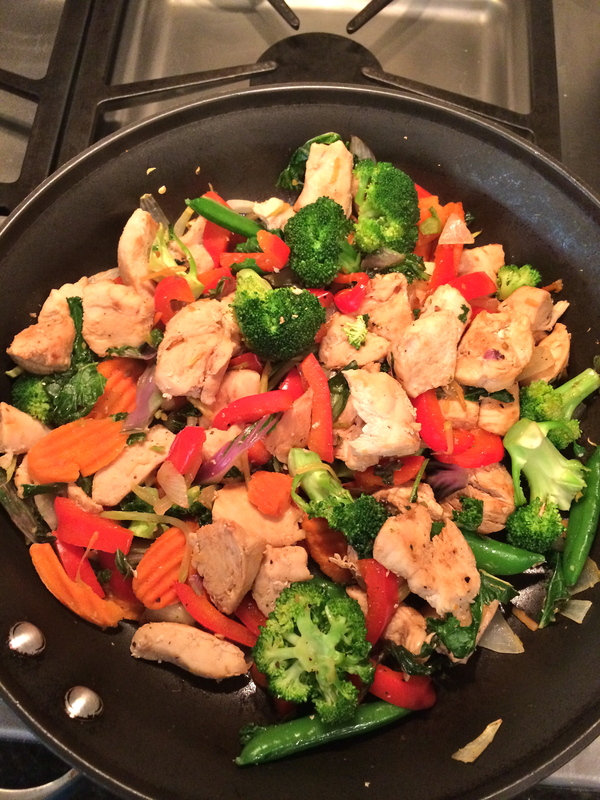 All you need are some frying pans, veggies, a protein of your choice, and some rice or noodles. 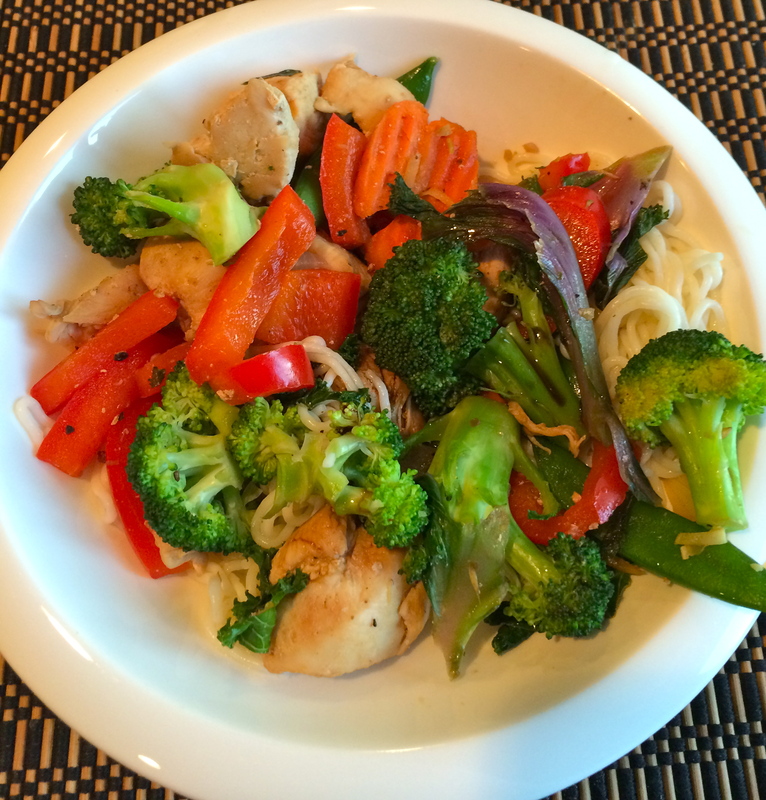 The beauty of stir fries are that you can use whatever ingredients you have on hand, and you can be creative with the types of food and sauce that you use. It’s fun, versatile, and can be ready in less than 30 minutes! This one of my favorite dishes to make when I want something very nutritious and filling, but I’ve had a long day and I don’t feel like spending a ton of time on cooking. I recommend defrosting meat in advance, but you can always quick-thaw. Buying a pre-cut and washed bag of frozen or fresh veggies also speeds up cooking time so you can fill up your tummy fast! An added bonus is that this meal is cheaper and healthier than take-out! Pre-cut and washed veggies, fresh or frozen (I like Taylor Farms fresh stir fry mix that I bought at Costco. It has broccoli, carrots, kale, snap peas, and already comes with a red ginger sauce)! I also added a diced red bell pepper and some diced onion. 1. Spray a pan with cooking spray or add 1 tbsp of oil. 2. Season the chicken with salt, pepper, garlic, and ginger, and cook in pan until slightly browned and cooked through. 3. Remove chicken from the heat, and add your vegetables to the pan. Cook until vegetables are crisp-tender. 4. Turn off the heat and add the chicken back to the pan. Add soy sauce/other sauce and stir. 5. Serve over rice or noodles, and enjoy! (I used House Tofu Shirataki spaghetti noodles). *I added some Sriracha sauce to my bowl, of course. Chat with Coneys and Kale: Snap a picture of your latest stir fry creation! Share on Facebook, Twitter, or Instagram!